Taking inspiration from the lean-to and Victorian conservatory, the P-shaped conservatory is a truly unique creation. Offering an impressive structure, the P-shaped bespoke conservatory is ideal for bringing extra floor space to larger properties. Traditionally constructed, the P-shaped conservatory is influenced by the classic Victorian and lean-to style. Combined with an exquisite design, these two conservatories culminate to create the P-shaped conservatory which serves as a highly versatile living area for you to utilise. This conservatory style is sure to be a fantastic addition to any home, both new and old alike. You won’t have to settle for anything less. Offering you something which is truly unique, the P-shaped conservatory is perfect for those who favour the lean-to’s simple groundwork and the Victorian’s added flair. A striking and eye-catching addition, the P-shaped conservatory exudes a timeless aesthetic that can be tailored to suit a vast array of property styles and sizes. There is no need for you to miss out on the quality on offer. Projecting outwards from your property, these conservatories offer an impressive structure. 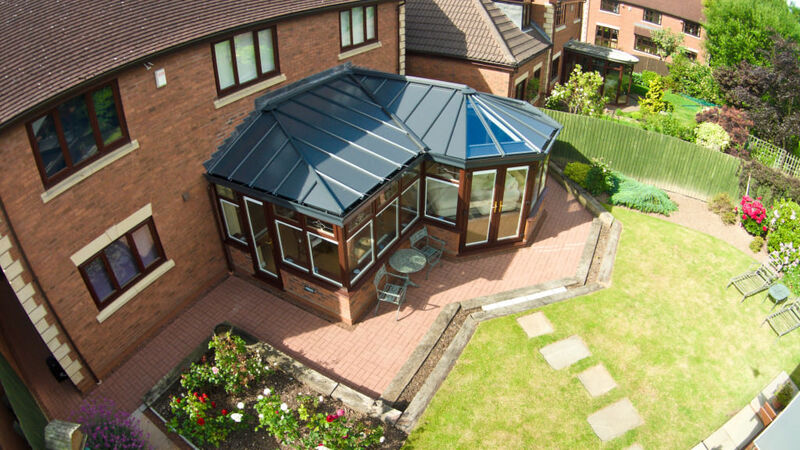 Best suited to larger, detached properties, the P-shaped conservatory can be either three-faceted or five-faceted. This Ultraframe conservatory will provide you with extra floor space, allowing you to divide your conservatory into two separate living areas. Homeowners throughout Leeds and Yorkshire have been using their new conservatory space for a comprehensive selection of uses. This includes gyms, offices, living rooms, dining rooms, games rooms, bedrooms and play rooms. A member of our expert installation team will be able to advise you on how to get the best choice for your home, ensuring you utilise the space that you have. As a badly fitted P-shaped conservatory can often result in problems with the aesthetic, performance and structural integrity, our team will make sure that the style you choose is compatible with your house structure. You won’t have to worry about leaks, draughts or safety problems when you choose Select Products for your conservatory installation. Registered with regulatory bodies such as FENSA. 10 year HomePro insurance backed Guarantee. Our base-work is built to meet all current building regulations, and is guaranteed for 5 years. Your conservatory will be installed by our team of highly qualified builders, who will make sure your conservatory is built to precision. The combination of premium grade materials and cutting-edge manufacturing techniques allows all of our P-shaped conservatories to excel across the board. Not only does this mean that you’ll be investing in a conservatory that is set to perform, you’ll also be able to enjoy a standard of durability that will continue to deliver quality to your home long after the initial installation. This means that even in the face of prolonged exposure to the elements, your conservatory will continue to perform time and time again. Here at Select Products, we have over 20 years of experience within the double glazing industry. Our team of experienced fitters and builders are highly qualified, and we pride ourselves on our exceptional installation services. You’ll be able to enjoy the complete peace of mind that comes with the knowledge that your conservatory installation is being handled properly. We strive to operate to the highest standards of professionalism, reliability, efficiency and promptness across the whole conservatory installation process. We understand that sometimes investing in a new home improvement solution can sometimes prove to be a stressful and time consuming affair if not handled properly. This is not something you will need to worry about. 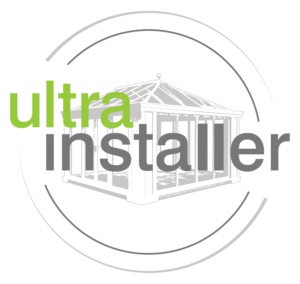 We utilise the leading conservatory roof systems from Ultraframe across our conservatory range, allowing you to bring the most technologically advanced roofing systems on the market to your home. As approved installers, we are well versed in handling this product as it should be, ensuring you always get the perfect fit for your property. Our conservatory roof options include the Livinroof conservatory roof design, which stands as the most configurable roof in the industry. Expertly combining all the benefits of a solid conservatory and glazed conservatory roof, you’ll be able to enjoy a ‘room-like feel throughout whilst still benefitting from generous amounts of glazing and natural light allowance. Due to their contemporary build, our P-shaped conservatories allow you to enjoy an area that remains useable throughout the year. Intelligent design means that you’ll be able to remain warm in the winter and cool in the summer, which means you won’t have to worry about the ‘oven’ or ‘freezer’ effect that has become infamous with older conservatory designs. Not only does increased heat retention allow you to enjoy a higher degree of comfort during the winter months, it also means you could notice a reduction in your heating bills. As warm air is trapped inside your conservatory, you could find yourself using your central heating much less to ensure a comfortable temperature. An established family business based in Leeds, we have helped many customers from the Yorkshire area get quality conservatories for their homes. We supply and fit bespoke P-shaped conservatories in Leeds, Ilkley, Harrogate, Bradford, Pudsey, Wetherby, Horsforth, Otley, Yeadon and surrounding areas. Whatever your home style, we can accommodate. To ensure minimal disruption to your daily life, we ensure all of our P-shaped conservatory installations are undertaken to a prompt degree. This way, you’ll be able to enjoy your new home improvement sooner, without having to compromise on quality. We always work to the highest standards of courtesy and respect. Use our online quote engine to design your dream bespoke conservatory today and get an instant online quote. 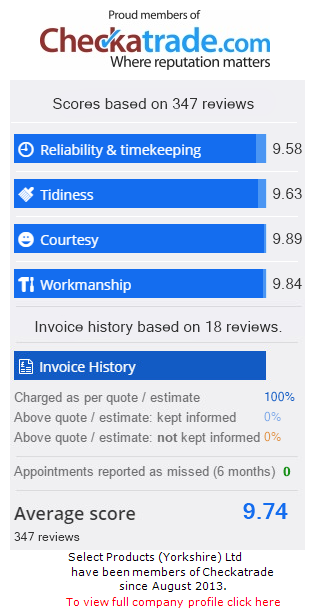 Our prices are very competitive, and we tailor them to meet your exact specifications so things will be as cost-effective as possible for you. It’s never been easier to enhance your home with Select Products. Alternatively, why not drop us a line via our online contact form or call us today on: 0113 257 8933. A member of our friendly team will be on hand to answer any questions or queries that you may have regarding our P-shaped conservatory design. We pride ourselves on offering a standard of service that is sure to satisfy.